ApexNetwork Physical Therapy is expanding within New Mexico! We will be opening our Cuba, NM clinic in July of 2017. The clinic will be located at 6344 Highway 550. The Cuba clinic joins our three existing locations in New Mexico to provide patients exemplary physical therapy services. ApexNetwork Physical Therapy have over 50 clinics nationwide in six states. ApexNetwork looks forward to becoming a part of the Cuba community! The Cuba clinic will provide rehabilitation services in the following areas: physical therapy, sports rehab, hand therapy, industrial rehab and manual therapy. Keep an eye out for future updates for the clinic opening. For a full list of locations, visit www.apexnetworkpt.com. 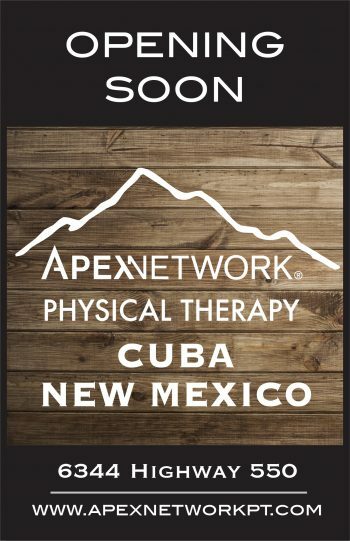 ApexNetwork Physical Therapy Opening Soon in Cuba, NM! ApexNetwork Physical Therapy Opening Soon in Mt. Sterling, KY!